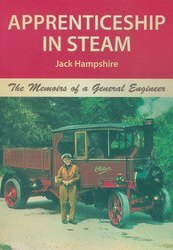 Companion to the same author's I Worked with Traction Engines, also available from us, this book of memoirs is from an slightly earlier period in Jack Hampshire's life, starting at the age of fourteen, when he was apprenticed to Carr Bros, a firm of general engineers in Sussex. This was during the Edwardian era, and whilst Jack is a "lively" story-teller, this book really does show what a wide range of work a country engineers of the period had to be able to undertake - and what a terrific grounding apprentices of the day received. A great read!